Possible wellbore positions in aquifer for slug tests analysis by Hvorslev’s method. 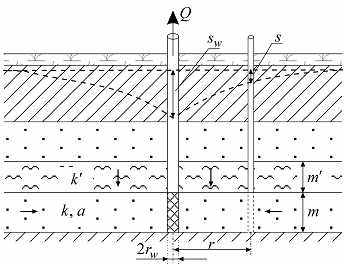 a – partially penetrating well at the top of confined aquifer; b – well placed in aquitard and contacting the aquifer only by bottom; c, d – partially penetrating well in unconfined aquifer (case d – only the bottom of the well open). 1) strait line should start from the origin of coordinates. 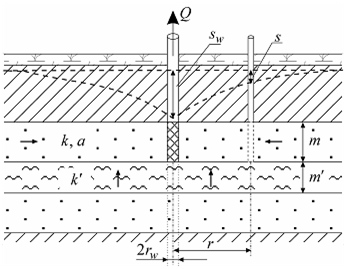 Hydraulic conductivity on the horizontal plane is estimated at given anisotropy factor on the vertical plane.